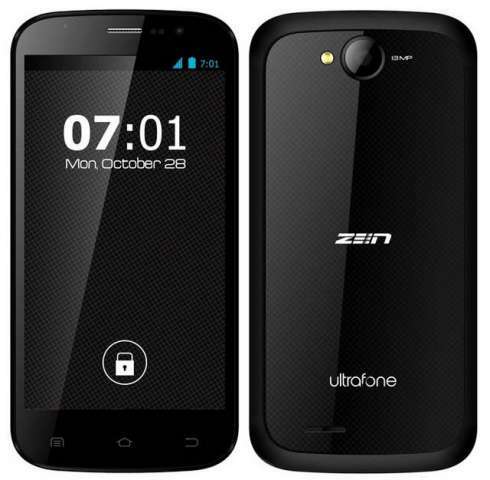 The specifications and price of Zen Ultrafone 701-FHD are out now. It is the latest smartphone from company with FULL HD display is now available from online store Snapdeal. Micromax Canvas Turbo A250 was launched a yesterday that comes with 2GB of RAM and 1.5GHz quad core processor. The Gionee Elife E6, Intex Aqua i7, iBerry Nuclea N1 are the handsets available in the market with FHD resolution display. The 701FHD has 5inch 1920×1080 pixels display HD IPS display based on OGS with Corning Gorilla-Glass 2 protection. It is powered by 1.5GHz MTK MT6589T 4-core processor integrated with 1GB of RAM and Android v4.2 Jelly bean operating system. The new Ultrafone comes with 13megapixel snapper at the back with BSI 2 sensorand 2megapixel front facing cam. Like the CanvasTurbo it also has 16gigbytes of on board storage and up to 64GB via micro SD card Slot. The price of new Ultrafone 701 FHD is Rs18,000 and it comes in black color. The official launch would take place on Monday (Amazing Launch). According to the company it will be the first social launch of a mobile phone in the world.